You might be thinking ‘What’s the point in branding something that no-one knows about?’ However we decided early on (when Crimson Phoenix was in it embryonic stages) that we wanted our brand to mean something and if our brand meant something, then everything had to follow suit. We actually stumbled onto our brand identity for our shows by accident. The first show ‘For King and Country’ lacked cast imagery because we developed the poster before the show had ever been performed. I also love minimalist design – or at least the idea that a poster should only have what it needs, nothing more and nothing less. Stephen agreed with my thinking and I set to work. So what is our show brand identity? The simplest way to describe it is a ‘less is more’ philosophy with three main sections: the title, one picture or image and the essential info – we like this because it is quick to absorb and recall. As people have less time, they might catch a glimpse of a image as they walk down an escalator (for example). The image has to cause the individual to consciously look at the whole poster. Once they have been looked at the poster, the normal mechanics kick in (in the UK we read from left to right and top to bottom so the title is always at the top and the first thing they will see when scanning a poster). Once they have the title, they have all they need to search for the show online. Simply put: the image is designed to make you glance, the title is designed make you remember. You’re probably wondering where the essential text comes into it – the truth of the matter is…it actually doesn’t. you see we don’t expect people to remember it – at least not consciously. Rather it is there to help you confirm when you look for the show that it is the same show (this is also the reason that media for each show looks the same across the board). With so much going on around us, it’s easy for people to get overwhelmed. By utilising three simple elements we reduce the amount of information the brain has to sort through and filter out. In fact the posters are designed so that the only thing you need to remember is the show title and the flyers are the same. This is most important at the Fringe, where they are so many posters and even more flyers. So how does this affect our decision-making? It means we have to choose the right image and design it with a specific end purpose. We have to ask ourselves, what does it mean? Why are we using this image? Is it saying what we want it to say? A brilliant example of choosing the wrong image is the ‘For King and Country’ poster. The image we chose was a WW1 army hat, which, combined with the title of the show led audience members to believe that they were going to watch a musical set in WW1 – so imagine their surprise when they find out it’s set at the same time as the Iraq war! The flip-side to this is ‘The Myle High Club’ where the image of a hand with blood on it suggest that someone has died – and holding a Myle High Club card must be significant. We felt that this was a much stronger image than that of ‘For King and Country because it was relevant to the show. Coupled with the cloud-like title and aeroplane, the show poster fitted all the main themes into one image (plane, flying death and club card scheme). 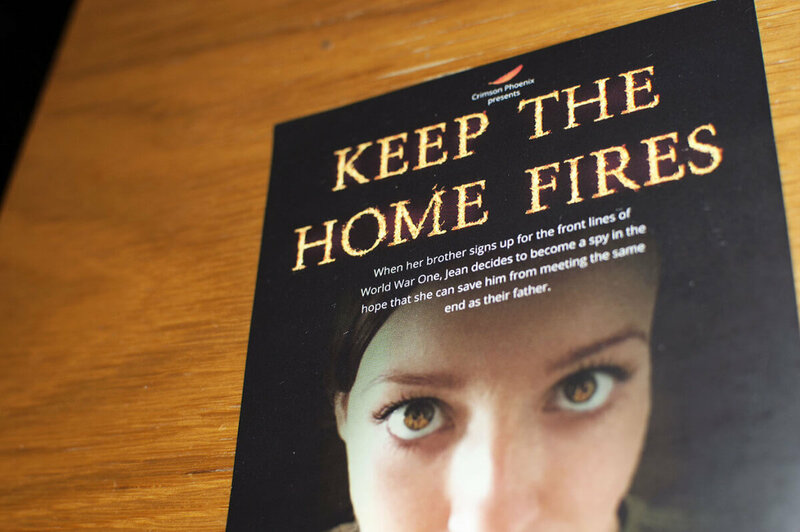 For ‘Keep the Home Fires’ it’s fair to say that our Fringe image needs work. The 2014 workshop version has a much stronger image, where the ‘perfect’ Eve is staring back at you. Incidentally, it’s the only time we have ‘photoshopped’ a person for the show media, but it was deliberately to make her look like the perfect housewife on the outside – while the story shows that she is anything but. Regardless, it was important that our branding remained consistent and time is a fickle friend…particularly when I’m not a professional designer, so we’re working with what we’ve got, while still maintaining our basic show brand identity. How do we anticipate it evolving? First things first, we want to get a professional designer to design the artwork. I’m no professional designer and as my remit as Managing Director expands, it makes sense to get a professional. They will have their own ideas on the branding and another perspective would help develop the concept further. We would like to integrate the company branding in a more subtle way, or at least a way that is in keeping with the colours and feel of the show, be that ‘The Myle High Club’ (1980s) or ‘Sophie’ (1970s). Finally we would like to explore the use of colour to keep each musical distinct from one another in the mind of our audience, as we believe that anything that helps our audience recall a specific show, can only be a good thing.